Christine here. This is a post on theory with a pinch of math, so if that’s not your thing, skip this one! 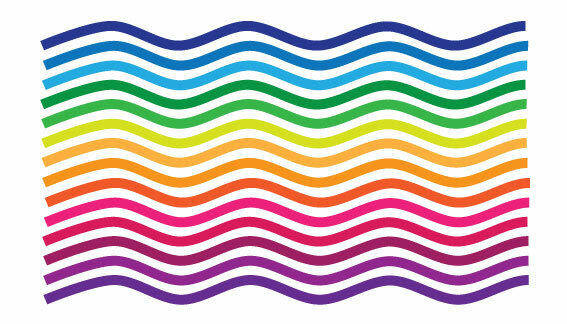 I have recently been enjoying stacking solid-colored braids with corners — see my flag below, which has stacked double corners to make the rippling waves. I previously started a strip rug with the same stacked double corners — and no, I haven’t finished it yet, because I want to have finished “reverse-T” ends and I’ve been putting that part off because they’re a pain. Anyway, I also wanted to start experimenting with curved rugs that would be in the same vein: parallel, solid braids that would stack and continue the same curves throughout the strip rug. To make myself get moving on this idea, I signed myself up to teach a “Curves and Corners Strip Rug” in Methuen, MA this October. (The Methuen workshop is a really fun weekend of braiding: if you’re interested, contact Carol for more information: carolbraids@gmail.com). Frankly, I am such the Princess of Procrastination, that I often use this technique to make myself work: I sign myself up to teach something that I haven’t quite figured out yet, and then I just have to do the work. I think you can see, if you look closely, that I have safety pins all over the rug. These are braided straight, then the curves are created by making increases and decreases wherever I have a pin, and I placed the pins at the same places on each braid. I’ve got 4 safety pins per curve. It looks kind of fun, but… it’s not going to work. Compare the curve on the top with the curve on the bottom. They’re not even remotely “parallel.” The curves are becoming more exaggerated with each braid — the outside curves are broader, the inside curves are skinnier. Wouldn’t work for what I want. So, in attempt #2, I went down on the increases and decreases to 3 per curve. I got a little closer to what I wanted, but not much: I’ve still got the difficulty of the outside curves getting broader, and the inside curves getting skinnier. NOT parallel. It’s probably hard to tell in the picture, but I was having to seriously stretch the braid just to make it around the outside curves in this attempt. Before going any further, I decided to go back to the drawing board. (Mind you, each of the above attempts took a LONG TIME to braid and lace and then unlace). I had realized that each of the increases and decreases was as if I were making a double corner, which works out to be about 115 degrees (I figured the 120 degree corners of a hexagon were close enough). So I went to my illustrator program to see if there were an obvious way to figure just how many increases and decreases I could get away with and still keep the braids parallel. Here, you can see what was happening with 3 corners per curve: the lower three stack nicely about the center point of each curve, BUT the transition braids from inside curve to outside curve stack directly ON TOP of each other. So, by lacing this area, I was having to force the braids further outward and further inward to make them lay flat. It would never have worked. Then, I tried stacking just 2 corners per curve. See how the transition braids are really close to one another? I think the same thing is going to end up happening, even with only 2 corners per curve. So, I am left with 2 options: go to only one corner per curve, or try stacking a 2-corner curve alternating with a 1-corner curve. Here is (approximately) is what a one-corner curve rug would look like. While I like it overall… it just doesn’t have enough curve in it for me. I think I’ll make one attempt at alternating between a two-corner and a one-corner braid, just to give it a little more curve. And, finally, I have diagrammed out how to deliberately make a super-sinuous rug, which after I make my class sample of the parallel braids, will be my next project. The “super sinuous” rug deliberately expands and contracts each curve, so that the braid actually doubles back on itself like the center of an oval rug. Nancy Young showed me a photo of a rug like this years ago and I’ve been dying to make a long runner for my upstairs hallway like this. Won’t this one be fun? Can’t wait to finish the last couple attempts at the parallel braids so that I can figure this next one out! Christine here. Does anyone remember those Braid Craft kits that were found in every fabric and craft store in the 1980’s and ’90’s? I was, in those years, either a college student working at an awful work-study job, or graduated and working as a mental health social worker for a salary that could barely pay my college loans, let alone my rent. Due to financial realities, I eventually left that field and re-trained in another. But at the time, I would see those Braid Craft kits and I would think, I would really like to learn how to do that. And then… assessing the contents of my purse… I’d have to walk away. Years later, after being rather intensely focused on rug braiding with wool since 2006, I thought about those kits and bought one from eBay. I was surprised at how thoughtfully put together the kits were. Even the illustrations (and I’m picky about illustrations) were pretty detailed and clear. This kit was not something hastily thrown together but was meant to clearly convey the pleasure of making something with braids. I got to thinking about the woman who had put these kits together. I googled Shirley Botsford and found her. She is living and working in Beacon, NY. She owns and runs a bed and breakfast (Botsford Briar Inn), designs for Simplicity Patterns, teaches classes on crafting in the Hudson Valley region of New York, and is a frequently-published author in the craft world. (Side comment: crafty people are always so interesting: they always delve into so many different areas at once). Looking up her books, one of them really intrigued me, called “Daddy’s Ties.” It presents a wide range of things that you can do with a loved one’s ties after his passing away. One of her projects with ties was a beautiful dress. This topic particularly interested me because I recently braided a “Memory Basket” of ties for a former co-worker after her husband died. I contacted Shirley and she graciously agreed to an interview for my newsletter on braiding, The Revolutionary Rug Braider. She told me about her life in the world of textile design, from designing fabrics to working with magazines and pattern companies to publishing her books and booklets. She mentioned that she had once, after a friend challenged her to do so, made a braided wedding gown. I almost jumped up and down in excitement while trying to ask her calmly if she had any pictures. She said she wasn’t sure where the pictures were but she could find the gown and take some new ones for me. 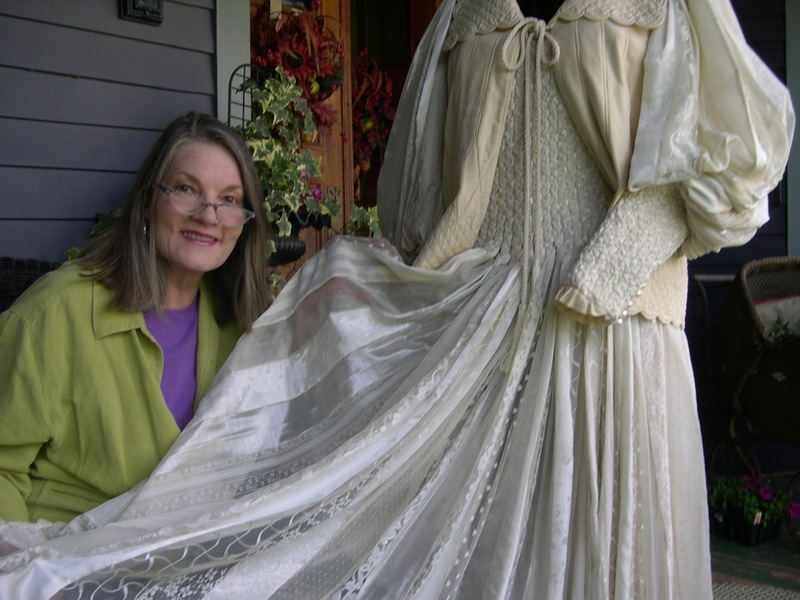 Shirley Botsford and “The Braided Bride,” which was her 1987 entry into the Fairfield Fashion Show. Shirley says she went through bottles of fray check while working on the dress, because those fabrics would start to fray if you looked at them. I had the greatest time talking to her, and hope to visit her at some point as I’m traveling through that region of New York!